Ya'alon's 'modest' funeral condition for terrorist body return proves false as thousands lionize terrorist who critically wounded officer. 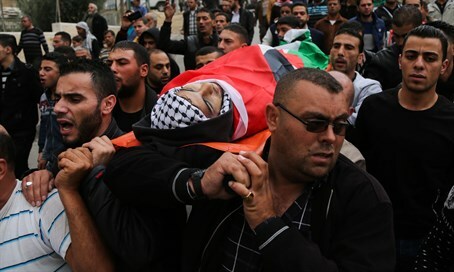 Even as the officer is fighting for his life in intensive care, Skafi was lauded as a "shahid," namely a martyr, in his massive funeral in Hevron that included a car with loudspeakers leading a chant in his praise shouted by the masses who waved hundreds of Palestine Liberation Organization (PLO) and yellow Fatah terror flags. Video from the funeral can be seen by clicking the image below. The funeral is particularly controversial given that the Security Cabinet last month decided to halt the return of the bodies of terrorists as a deterrent move - and yet Skafi's body was returned the same day as his car attack. Defense Minister Moshe Ya'alon defended the return of terrorists' bodies saying holding the bodies is not a deterrent, and further claiming the decision to return is made "on a case-by-case basis, where the main consideration is if there'll be a massive funeral, which is why the decision was made to return bodies on the condition funerals are quiet and modest." As evident in the video, the claim that there is a condition of "quiet and modest" funerals is clearly false given the outpouring of celebration for the murderous terrorist seen in Hevron today. Ya'alon, in making the statements that led to a backlash from several MKs, also claimed the same "condition" was present for the decision to return the bodies of five terrorists to Hevron last Saturday. However, that massive funeral in breach of the Cabinet decision was far from "modest," comprising of thousands of participants who eventually turned their rage at IDF soldiers and began hurling rocks at them. The Palestinian Authority (PA) announced Wednesday that it still is awaiting the bodies of ten more terrorists to bury with large pomp and circumstance - PA Chairman Mahmoud Abbas, following the Saturday funeral, ordered full military funerals for all terrorists.